The name of the mountains may refer to the occasional reddish hues observed during sunrise and sunset, and when alpenglow occurs, especially when the mountains are covered with snow. Although the particular origin of the name is unclear, it has been in use since the early 19th century. Before that time the terms "La Sierra Nevada", "La Sierra Madre", "La Sierra", and "The Snowies" (used by English speakers) were used. Sometimes the archaic Spanish spelling "Christo" is used. The Spanish Peaks are a pair of volcanic mountains, West Spanish Peak and East Spanish Peak, located in southwestern Huerfano County, Colorado., the Spanish Peaks were designated a National Natural Landmark in 1976 as one of the best known examples of igneous dikes. The mountains can be seen as far north as Colorado Springs (133 miles), as far west as Alamosa (85 miles), points south to Raton, New Mexico (65 miles), and points east of Trinidad (up to 15 miles). The Culebra Range runs almost due north and south, with its northern limit at La Veta Pass in Colorado, and its southern limit at Costilla Creek, just south of Big Costilla Peak in New Mexico. Its highest point is Culebra Peak (14,047 feet/4,282 m), which is notable for being the only fourteener in Colorado which is on private land. Climbers wishing to ascend Culebra must pay a fee (currently US$100 per person), and the number of climbers per year is limited. Standing to the east of the main crest are the two prominent Spanish Peaks (West: 13,626 feet/4,153 m; East: 12,860 feet/3,920 m). Unlike the rest of the Sangre de Cristo Mountains, these are volcanic, with conical shapes and prominent dikes radiating outward. These peaks were important landmarks on the mountain branch of the Santa Fe Trail. 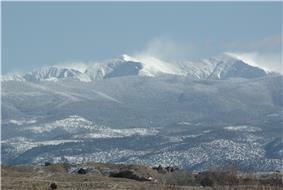 The Taos Mountains span the western lobe of the range from Costilla Creek in the north, to Tres Ritos in the south. 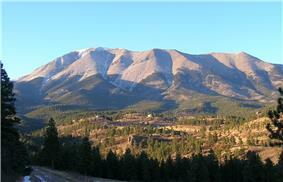 They include the highest point in New Mexico, Wheeler Peak 13,161 feet (4,011 m), which is part of the small Wheeler Peak Wilderness. Other notable peaks include Pueblo Peak 12,305 feet (3,751 m), which rises dramatically above Taos Pueblo, and Latir Peak 12,708 feet (3,873 m). Williams Lake is located below Wheeler Peak in the Wheeler Peak Wilderness. 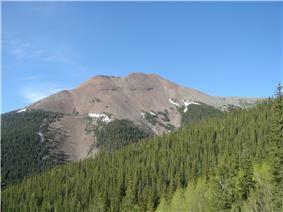 The southern portion of the Taos Mountains, between Palo Flechado Pass and Tres Ritos (US Route 64 and NM Route 518), is lower and less dramatic than the northern section, with its high point being Cerro Vista, 11,939 ft (3,639 m). The Fernando Mountains are a small subrange lying in this section, just south of US Route 64. 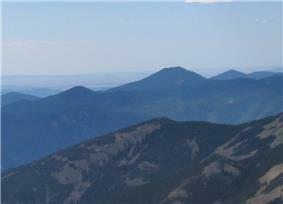 The Cimarron Range lies across the Moreno Valley to the east of the Taos Mountains. 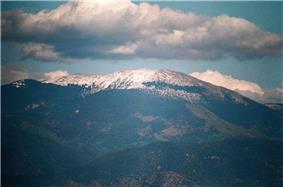 It is a lower range, with its highest point being Baldy Mountain (12,441 feet/3,792 m). The Philmont Scout Ranch lies on the east side of the Cimarron Range. 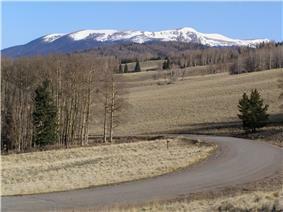 Rounding out the Sangre de Cristo Mountains are the Santa Fe Mountains, which include all peaks south of NM Route 518. This group lies near Santa Fe and surrounds the Pecos Wilderness, which protects the source watershed of the Pecos River. 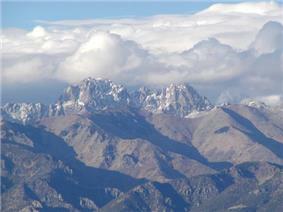 The peaks include Truchas Peak (13,102 feet/3,994 m) as their highest point. 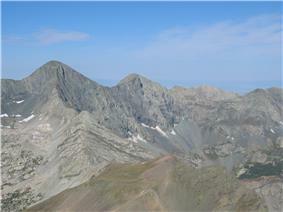 Other notable peaks are Santa Fe Baldy (12,622 feet/3,847 m) and Jicarita Peak (12,835 feet/3,912 m). 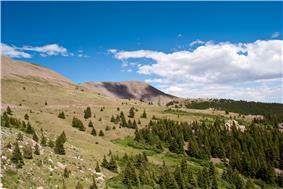 The Pecos Wilderness is crossed by many trails and is popular for backpacking and for fishing in its high alpine lakes. ^ Chronic, Halka (1998). Roadside Geology of Colorado. Mountain Press Publishing Company. p. 36. “Glorieta and Raton Passes: Gateways to the Southwest”NPS—TwHP: — a National Park Service Teaching with Historic Places (TwHP) lesson plan.